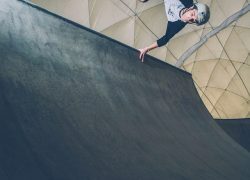 For this Trick Tip Tuesday, Andrew and Lucia, the Angelina Jolie doppelganger, from GoSkate.com, teach you how to consistently land frontside bigspins. A proper frontside bigspin starts with leading your upper body in the turning. If you are having trouble spinning the board all 360 degrees, you can try the bigspin off a curb or stairset. This will give you more time to spin.